An activity from a user perspective refers to any tool that can be dragged onto a Warewolf Studio design surface. Activities are composed into Warewolf services and are the basic building blocks for Warewolf services. There are two overall categories of Activity, Grid Activities and Non-grid Activity. Grid Activities can accept any number of user inputs via a data grid on the design surface while Non-grid Activities have a fixed number of user inputs. The XAML that defines the activity look and feel. Views can be found in the Dev2.Activities.Designer project. Activities can have both a large detailed view as well as a small condensed view. Encapsulates design surface logic, like validation of inputs and enabling and disabling an item on the designer. 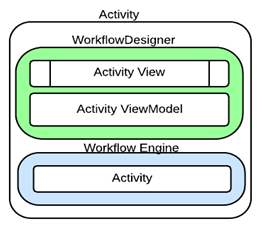 Activity view models are located in the Dev2.Activities.Designer project. Non Grid Activities inherit the ActivityDesignerViewModel class while Grid Activities inherit the ActivityCollectionDesignerViewModel class. Coordinates debug input and output. Warewolf encourages reusability by allowing services and microservices to be nested. A service can be dragged and dropped onto the design surface and will execute like any other activity. Nested services derive from the DSFActivity class and encompass plugins, web services, database services and workflow services. During execution, nested services are run in isolated execution containers that handle the scope and data transfer.